FREE Ground Burial Space for Veterans in Soldier's Circle with purchase of vault or cremation vault (if necessary). Flat markers only. 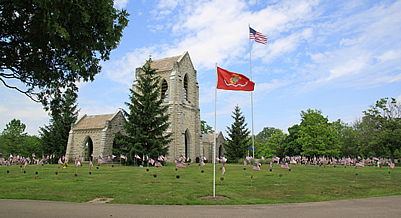 FREE Ground Burial Space for Veterans anywhere in Cemetery with purchase of a vault and additional burial space. Crypts discounted by $600 and Niches by $200. Vault, Opening/Closing and Government Marker Installation are Veteran's expense. A beautiful complement to any monument is the vase to hold flowers. We offer a line of vases to complement your monument design. And as with our monuments, the service and workmanship is of the highest quality. Vases are an attractive addition to your monument. Click here to contact us today to purchase and arrange for installation in the cemetery. For additional Information and pricing, please contact Helen Caldwell. Dayton Memorial Park Cemetery offers a selection of flowers for vases and saddles for the top of the monument. Contact us today and we can take your order and place the flowers for your loved one. Please Support Our Special Projects! Flag Poles to Honor our Veterans Project: Section 22, needs Larger/Taller Flag Poles to replace the smaller/shorter flag poles now in existence. With your help, we can accomplish this goal sooner rather than later. Section Identification Signage Project: We find that each generation is interested in their family/loved ones' burial sites. Our section identification signage is nearly non-existent or is badly in need of replacement. This identification signage helps all of our Cemetery supporters locate their loved ones. With your help, we can expedite this Section Identification Signage replacement project which will benefit everyone. Stop by our office to see a sample of the section identification signage or to chat with our staff about supporting this important project.